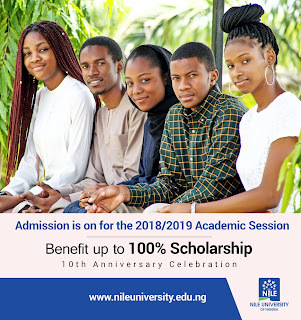 Nile University of Nigeria, Scholarships and Discounts, Payment and Refund Policies and Opportunities for Undergraduates and Postgraduates Applicants and Students of the Institution for the 2018/2019 Academic Session. 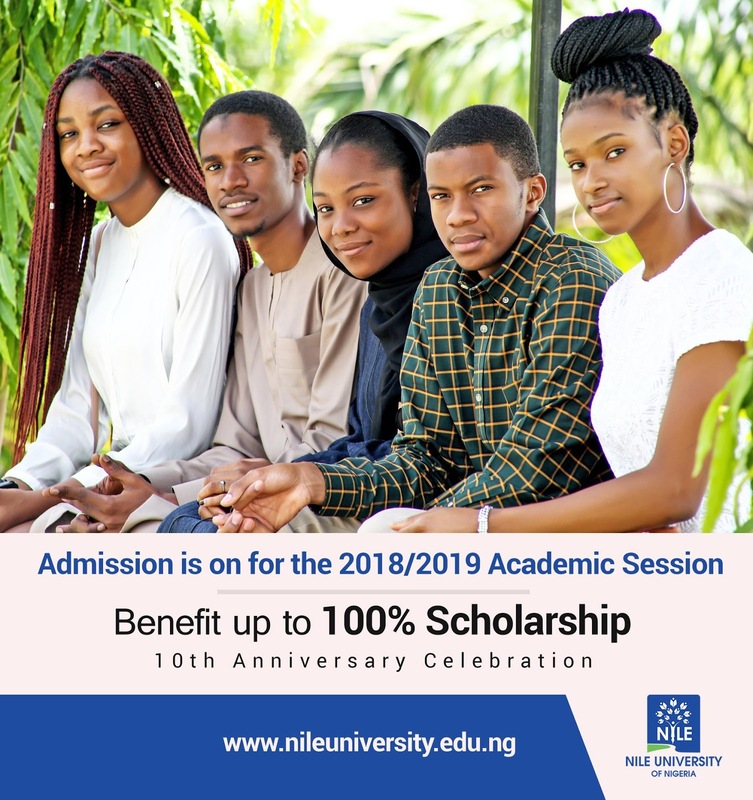 The Nile University of Nigeria, has released and published the Scholarships, Discounts, Payment and Refund Policies and Opportunities entitled to undergraduates and postgraduate applicants or students of the institution. a. The amount of scholarships due to JAMB and WASSCE results is as announced by the Board of Trustee of the Nile University of Nigeria NUN. – For Medicine, a JAMB score of 250 attracts 10% discount, 260 attracts 20% discount, and 270 attracts 30% discount and so forth. No discount for WAEC results. – For Law, a JAMB score of 240 attracts 10% discount, 250 attracts 20% discount, and 260 attracts 30% discount and so forth. WASSCE/WAEC grades of 4A’s attracts 10% discount, 5 A’s attracts 20%, 6 A’s attracts 30% and so forth. – For other Departments, a JAMB score of 220 attracts 10% discount, 230 score attracts 20% discount, and 240 score attracts 30% discount and so forth. c. Students with 3 A’s and above in WASSCE together with a JAMB score of 300 and above will get 100% scholarship. d. Students with outstanding performance in sports at national or professional level will get up-to 100% scholarship, if they participate in NUN team. – You must complete your studies within the stipulated period allowed. -You must not be involved in any act of misconduct or disciplinary act. -The university reserves all the right to terminate your Scholarship if the need arise. a. NTIC graduates coming to NUN are given a special amount of discount which is mentioned by the BOT for each year. They have given 10 to 40 discount to the newcomers to NUN for 2017 – 2018 academic session. • 5 children and more- 20% discount for each child. c. Only one (1) immediate family member (child or wife) of the NUN staff will be given 50% discount. The discount will continue as long as the staff is still working with the university. d. BOT of NUN determines the amount of discount for foreign staff family members. – Three individuals from the same corporate organization get a discount of 10% for each person, five people and above get a discount of 20% for each person and ten people and above get a discount of 30% for each person. – The Board of trustees and management of the Nile University of Nigeria have agreed that for all Academicians who wish to apply for the 100% scholarship are to bring a reference letter from their Dean and HOD to the Board of Trustees for approval. They shall work for NUN for 2 years after graduation. The NUN first class graduates do not have this obligation. – Non-Academicians “who have worked here for 3 years are entitled to apply for an 80% discount scholarship as well. They shall work for NUN for 2 years after graduation in their promoted position. a) The Tuition Fee is being announced before the beginning of each session. b) Tuition Fee should be paid at once at the beginning of the session or in 2 installments at the beginning of each semester. The ones who did not pay on planned time interval, he/she shall miss his/her semester. c) Tuition fee and the number of discounts or scholarships should be written on the Admission Letter. d) Candidates who pay during the late registration period (Week) will also pay the late registration penalty. e) Fees can be reviewed annually depending on the economic condition of the country. deducted from the paid fees. b) In the case of deferment, all money will be refunded. canceled. In the case of re-admission, the current tuition fee shall apply. d) Spillover students will pay 50.000 Naira for each credit. To Benefit from any of the above please head over to the Nile University Admission Page for 2018/2019 Session to begin application immediately.